Diffuse alveolar damage is the histopathological hallmark of acute respiratory distress syndrome (ARDS) and is a stereotypic response to a variety of etiologies. Moreover, a significant proportion of ARDS survivors have residual pulmonary fibrosis and compromised pulmonary function. This suggests that the pathogenesis of diffuse alveolar damage that ultimately leads to the chronic fibrosis of ARDS has features of dysregulated repair exemplified by exaggerated intra-alveolar angiogenesis and fibrogenesis (i.e., fibroproliferation and deposition of extracellular matrix), leading to progressive alveolar fibrosis and impaired lung function. We obtained bronchoalveolar lavage fluid (BALF) from patients with ARDS or ventilated control patients and assessed CXC chemokine levels by ELISA. We found an imbalance in the expression of ELR+ as compared with ELR− CXC chemokines from BALF of patients with ARDS as compared with controls. This imbalance correlated with angiogenic activity as assessed by the corneal micropocket assay. Furthermore, these levels correlated with both procollagen I and procollagen III levels in BALF. In contrast, while BALF levels of vascular endothelial growth factor were elevated, vascular endothelial growth factor did not appear to be significantly contributing to the angiogenic activity. These findings suggest that CXC chemokines have an important role in the fibroproliferative phase of ARDS via the regulation of angiogenesis. Diffuse alveolar damage (DAD)3 is the histopathological hallmark of acute respiratory distress syndrome (ARDS) and is a stereotypic response to a variety of etiologies (1, 2). DAD is related to an overlapping continuum of injury: an acute exudative phase (days 0–4), a subacute proliferative phase (days 2–8), and a chronic fibrotic phase (after day 4) (2, 3, 4, 5, 6, 7, 8, 9). This latter phase predisposes ARDS patients to prolonged mechanical ventilation with high inflation pressures and increased oxygen exposure (10). Moreover, a significant proportion of ARDS survivors have residual pulmonary fibrosis and compromised pulmonary function (11). This suggests that the pathogenesis of DAD that ultimately leads to the chronic fibrosis of ARDS has features of dysregulated repair with intra-alveolar deposition of extracellular matrix and vascular remodeling, leading to progressive alveolar fibrosis and impaired lung function. Our laboratory has shown that members of the CXC chemokine family exert disparate effects in mediating angiogenesis as a function of the presence or absence of three amino acid residues (Glu-Leu-Arg; the “ELR motif”) that immediately precedes the first cysteine amino acid of the primary structure of these cytokines (12, 13). Epithelial neutrophil-activating protein 78 (ENA-78)/CXC ligand (CXCL) 5, growth-related oncogene (GRO) α/CXCL1, and IL-8/CXCL8 all contain the ELR motif, which confers potent angiogenic activity, whereas members such as IFN-γ-inducible protein 10 (IP-10)/CXCL10 and monokine induced by IFN-γ (MIG)/CXCL9 that lack the ELR motif inhibit angiogenesis. We hypothesized that the pathogenesis of DAD with pulmonary microvascular remodeling and alveolar fibrosis is due, in part, to dysregulated angiogenesis, with overexpression of angiogenic and down-regulation of angiostatic CXC chemokines. In this study, we measured ELR+ CXC chemokines (IL-8/CXCL8, ENA-78/CXCL5, and GRO-α/CXCL1), ELR− CXC chemokines (IP-10/CXCL10 and MIG/CXCL9), and vascular endothelial growth factor (VEGF) by specific ELISA. ELR+ CXC chemokines were significantly greater than ELR− CXC chemokines from BALF of ARDS patients as compared with the control group. Furthermore, these levels correlated with both procollagen III and procollagen I levels in the bronchoalveolar lavage fluid (BALF) of these patients. CXC chemokines appeared to contribute to the majority, if not all, of the angiogenic activity in the ARDS specimens. These findings support the notion that ELR+ CXC chemokines have an important role in the fibroproliferative phase of ARDS via the regulation of angiogenesis. Bronchoalveolar lavage was obtained from five patients with recent onset (3–5 days) ARDS and four mechanically ventilated control patients. Bronchoalveolar lavage was performed as previously described (14). BALF recovery was >50% of the instilled volume. ARDS was defined according to the American European consensus conference guidelines (15, 16). The controls had no evidence of lung disease and were being ventilated for reasons other than respiratory failure. Lung tissue specimens for immunohistochemistry were obtained from postmortem specimens of patients that had died with ARDS. Appropriate Institutional Review Board approval and informed consent was obtained. Polyclonal anti-human IL-8/CXCL8, GRO-α/CXCL1, ENA-78/CXCL5, IP-10/CXCL10, MIG/CXCL9, CXCR2, and VEGF Abs and human IL-8/CXCL8, GRO-α/CXCL1, ENA-78/CXCL5, IP-10/CXCL10, MIG/CXCL9, and VEGF were purchased from R&D Systems (Minneapolis, MN). The specificity of the Abs was assessed by Western blot analysis and ELISA against a panel of other recombinant cytokines. Abs were specific in our sandwich ELISA without cross-reactivity to a panel of cytokines, including IL-1R antagonist protein, IL-1, IL-2, IL-4, IL-6, TNF-α, IFN-γ, and other members of the CXC and CC chemokine families (17, 18). The “anti-protease” buffer for tissue homogenization consisted of 1× PBS with one Complete tablet (Boehringer Mannheim, Indianapolis, IN) per 50 ml. Rabbit anti-factor VIII-related Ag Abs were purchased from Biomedia (Foster City, CA). Antigenic human IL-8/CXCL8, GRO-α/CXCL1, ENA-78/CXCL5, IP-10/CXCL10, MIG/CXCL9, VEGF, and procollagen I were quantitated using a modification of an ELISA as previously described (17, 18). The sensitivity of our ELISAs are ≥50 pg/ml. Briefly, flat-bottom 96-well microtiter plates (Nunc, Roskilde, Denmark) were coated with 50 μl/well of the appropriate polyclonal Ab (1 ng/μl in 0.6 M NaCl, 0.26 M H3B04, and 0.08 N NaOH (pH 9.6)) for 24 h at 4°C and then washed with PBS and 0.05% Tween 20 (wash buffer). Nonspecific binding sites were blocked with 2% BSA. Plates were rinsed and samples were added (50 μl/well), followed by incubation for 1 h at 37°C. Plates were then washed and 50 μl/well of the appropriate biotinylated polyclonal Ab (3.5 ng/μl in wash buffer and 2% FCS) was added for 45 min at 37°C. Plates were washed three times, streptavidin-peroxidase conjugate (Bio-Rad, Richmond, CA) was added, and the plates were incubated for 30 min at 37°C. Chromogen substrate (DAKO, Carpinteria, CA) was then added, and the plates were incubated at room temperature to the desired extinction. Plates were read at 490 nm in an automated microplate reader (Bio-Tek Instruments, Winooski, VT). Standards were 1/2 log dilutions of recombinant cytokine from 100 ng to 1 pg/ml (50 μl/well). Procollagen III was measured by a RIA using a modification of a method as previously described (19, 20). Briefly, concentrations of procollagen III peptide (PIIIP) in BALF samples were measured by RIA using RIA-gnost PIIIP (CIS Biointernational, Gif-Sur-Yvette, France) according to the manufacturer’s instructions, as previously described (19). BALF samples (undiluted) were measured in duplicate, and samples were further diluted as needed to allow interpolation of PIIIP values from simultaneously generated standard curves. Paraffin-embedded tissue from control and idiopathic pulmonary fibrosis (IPF) lung was processed for immunohistochemical localization of IL-8/CXCL8, ENA-78/CXCL5, GRO-α/CXCL1, and CXCR2. Briefly, tissue sections were dewaxed with xylene and rehydrated through graded concentrations of ethanol. Tissue-nonspecific binding sites were blocked using normal goat serum (BioGenex, San Ramon, CA). Tissue sections were then washed and overlaid with a 1/500 dilution of either control (rabbit) or polyclonal rabbit Abs to the appropriate chemokine or receptor. The tissue sections were washed and then incubated for 60 min with secondary goat anti-rabbit biotinylated Abs (BioGenex). After washing twice with TBS, slides were overlaid with a 1/35 dilution of peroxidase conjugated to streptavidin (Vector Laboratories, Burlingame, CA) and incubated for 60 min. Tissue sections were then incubated with Vectastain avidin-biotin complex reagent (Vector Laboratories) followed by the peroxidase substrate diaminobenzidine reagent (Vector Laboratories). After optimal color development, tissue sections were immersed in sterile water, counterstained with Mayer’s hematoxylin, and coverslipped using an aqueous mounting solution. Paraffin-embedded ARDS lung tissue was processed for immunohistochemical localization of factor VIII-related Ag as previously described (21). Briefly, tissue sections were dewaxed with xylene and rehydrated through graded concentrations of ethanol. Slides were blocked with normal rabbit serum (BioGenex) and overlaid with a 1/500 dilution of either control (goat) or goat anti-factor VIII-related Ag Abs. Slides were then rinsed and overlaid with secondary biotinylated rabbit anti-goat IgG (1/35) and incubated for 60 min. After washing twice with TBS, slides were overlaid with a 1/35 dilution of peroxidase conjugated to streptavidin (Vector Laboratories) and incubated for 60 min. Tissue sections were then incubated with Vectastain avidin-biotin complex reagent (Vector Laboratories) followed by the peroxidase substrate diaminobenzidine reagent (Vector Laboratories). After optimal color development, tissue sections were immersed in sterile water, counterstained with Lerner’s hematoxylin, and coverslipped using an aqueous mounting solution. Angiogenic activity of BALF was assayed in vivo in the avascular cornea of hooded Long-Evans rat eyes, as previously described (12, 17, 18, 21, 22, 23). Briefly, equal volumes of BALF normalized to total protein were combined with sterile Hydron (Interferon Sciences, New Brunswick, NJ) casting solution. Five-microliter aliquots were pipetted onto the flat surface of an inverted sterile polypropylene specimen container and polymerized overnight in a laminar flow hood under UV light. Before implantation, pellets were rehydrated with normal saline. Animals were anesthetized with ketamine (150 mg/kg) and atropine (250 μg/kg) i.p. Rat corneas were anesthetized with 0.5% proparacaine hydrochloride ophthalmic solution followed by implantation of the Hydron pellet into an intracorneal pocket (1–2 mm from the limbus). Six days after implantation, animals received 1000 U of heparin and ketamine (150 mg/kg) i.p., followed by a 10-ml perfusion of colloidal carbon via the left ventricle. Corneas were harvested and photographed. No inflammatory response was observed in any of the corneas treated with the above specimens. Positive neovascularization responses were recorded only if sustained directional ingrowth of capillary sprouts and hairpin loops toward the implant were observed. Negative responses were recorded when either no growth was observed or when only an occasional sprout or hairpin loop displaying no evidence of sustained growth was detected. All animals were handled in accordance with the Department of Laboratory Animal Medicine at the University of California, Los Angeles. Data were analyzed on a Dell PC computer using the Statview 4.5 statistical package (Abacus Concepts, Berkeley, CA). ELISA data were compared using the nonparametric Mann-Whitney U test. A p of 0.05 or less was considered to be significant. Previous studies have indicated the presence of vascular remodeling in ARDS (3, 24). On this basis, we assessed the presence of vascular remodeling in ARDS. We confirmed the presence of angiogenic activity by demonstrating significant vascular remodeling in ARDS lung tissue specimens as evidenced by the immunolocalization of factor VIII-related Ag (Fig. 1⇓, C and D). Similarly, CXCR2, the receptor for ELR+CXC chemokines was localized predominantly to vascular endothelium (Fig. 1⇓B). Furthermore, using the corneal micropocket assay we found that pooled samples of ARDS BALF (Fig. 2⇓B) induced a greater angiogenic response, as compared with ventilator control BALF (Fig. 2⇓A; n = 6 for each manipulation). Photomicrograph of the immunolocalization of factor VIII-related Ag and CXCR2 in ARDS lung tissue. A, ARDS lung specimen immunostained with control Abs demonstrating the lack of nonspecific staining (original magnification, ×40). B, ARDS lung specimen immunostained for CXCR2 demonstrating immunolocalization to vascular endothelium (original magnification, ×40). C and D, Same ARDS lung specimen immunostained for factor VIII-related Ag (original magnification, ×40 and ×60, respectively). Representative photograph of corneal neovascularization in response to BALF specimens (original magnification, ×25). A, Ventilator control BALF. B, BALF from ARDS patients (n = 6 corneas for each group). Levels of procollagen I and procollagen III from BALF of patients with ARDS (n = 5) or ventilator control patients (n = 4). Procollagen I was measured by specific ELISA and procollagen III was measured by RIA. We obtained BALF from patients with either recent onset ARDS (days 3–5; n = 5) or patients who were being ventilated for reasons other than respiratory failure (control BALF; n = 4) and measured IL-8/CXCL8, ENA-78/CXCL5, GRO-α/CXCL1, IP-10/CXCL10, and MIG/CXCL9 by specific ELISA. BALF from ARDS patients demonstrated a significant increase in neutrophils as compared with controls (p < 0.05; Table I⇓). BALF from ARDS patients, as compared with control BALF, demonstrated greater levels of IL-8/CXCL8 (1.22 ± 0.76 ng/ml vs 0 ± 0 ng/ml), ENA-78/CXCL5 (1.77 ± 0.54 ng/ml vs 0.1 ± 0.09 ng/ml), and GRO-α/CXCL1 (10.87 ± 3.73 ng/ml vs 0.1 ± 0.1 pg/ml) (p < 0.05; Fig. 4⇓). In contrast, BALF from ARDS demonstrated equivalent levels of IP-10/CXCL10 (0.48 ± 0.38 ng/ml vs 0.49 ± 0.05 ng/ml) (p = NS). Levels of MIG/CXCL9 (1.48 ± 0.93 ng/ml vs 0.21 ± 0.039 ng/ml; p < 0.05) were elevated as compared with control BALF (Fig. 5⇓). The ratio of ELR+ to ELR− CXC chemokines favored ELR+ CXC chemokines and net angiogenic activity (Table II⇓). We also measured levels of VEGF and found that BALF from ARDS patients, as compared with control BALF, demonstrated greater levels of VEGF, although not to the same magnitude as the CXC chemokines (0.15 ± 0.06 pg/ml vs 0.0 ± 0.0 pg/ml) (p = 0.05; Fig. 4⇓). ELR+ CXC chemokine levels and VEGF levels from BALF of patients with ARDS (n = 5) or ventilator control patients (n = 4). Chemokine levels were measured by specific ELISA. ELR− CXC chemokine levels from BALF of patients with ARDS (n = 5) or ventilator control patients (n = 4). Chemokine levels were measured by specific ELISA. 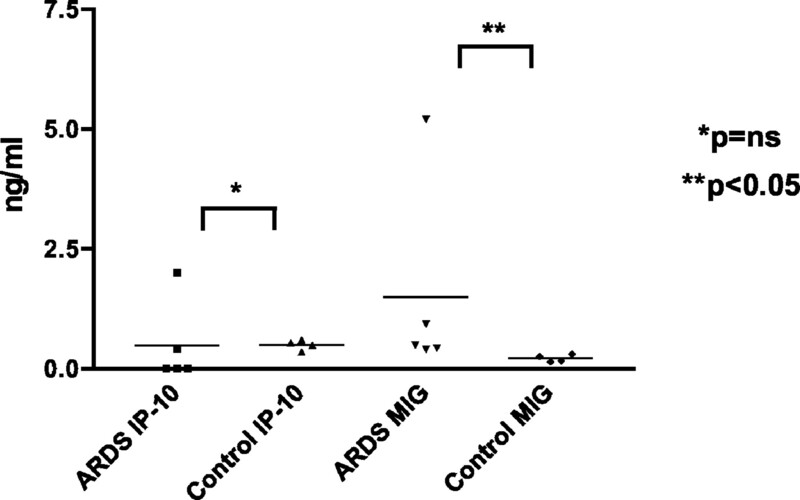 The histopathology of ARDS is characterized by inflammatory infiltrates. Since IL-8, ENA-78, and GRO-α were elevated in BALF, we next assessed the predominant cellular source of these chemokines in ARDS lung tissue. Using immunohistochemistry, we found that the predominant cells in ARDS lung tissue that expressed IL-8 and ENA-78 were macrophages (Fig. 6⇓). The predominant cells expressing GRO-α were macrophages and also endothelial and epithelial cells (Fig. 6⇓). In contrast, the predominant cells expressing CXCR2 were vascular endothelial cells (Fig. 1⇑B). 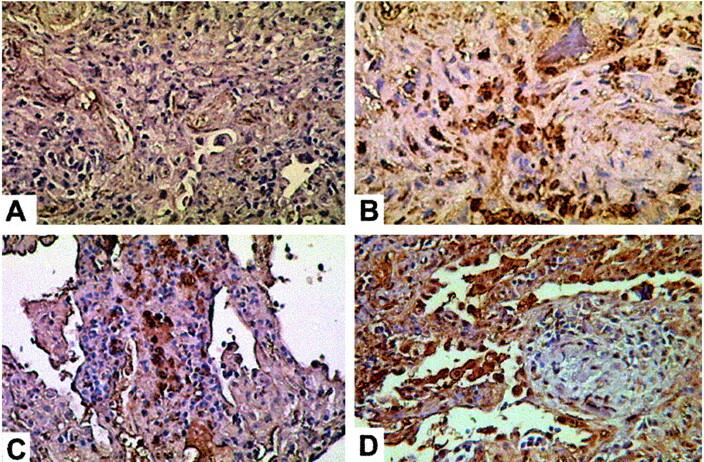 Immunolocalization of CXC chemokines from lung tissue specimens from patients with ARDS demonstrating immunolocalization to macrophages and epithelial cells. A, Control Ab demonstrating the lack of nonspecific staining. B, Staining with IL-8 Abs demonstrating localization to macrophages. C, Staining with ENA-78 Abs demonstrating localization to macrophages. D, Staining with GRO-α Abs demonstrating localization to macrophages and epithelial cells. Original magnification, ×160. To substantiate that these CXC chemokines may be modulating lung tissue-derived angiogenic activity, we next assessed the in vivo angiogenic activity of random pooled samples of either control (n = 4) or ARDS BALF (n = 5) in the presence or absence of preimmune (control) or neutralizing CXCR2 Abs, using the rat corneal micropocket model of neovascularization (Fig. 7⇓ and Table III⇓). CXCR2 is the major receptor for all of the ELR+ CXC chemokines. These Abs did not contain significant quantities of LPS contamination as assessed by Limulus assay, and all samples were normalized to total protein. Neutralizing Abs to CXCR2 significantly attenuated the angiogenic activity of ARDS BALF (1 of 6 positive; Fig. 7⇓ and Table III⇓), as compared with control Abs (6 of 6 positive; Fig. 7⇓ and Table III⇓) (n = 6 for each manipulation). These findings suggest that the ELR+ CXC chemokines are significant angiogenic factors in ARDS. 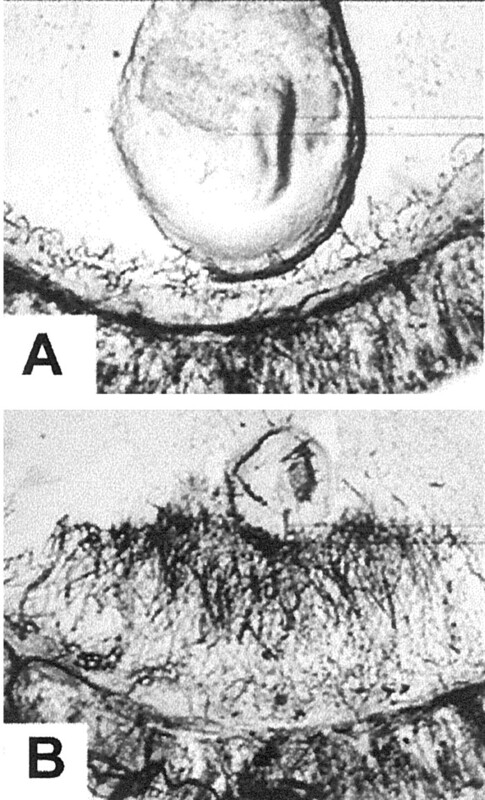 Representative photograph of corneal neovascularization in response to BALF specimens (original magnification, ×25). A, ARDS BALF and control Ab. B, ARDS BALF and neutralizing anti-CXCR2 Ab. C, ARDS BALF and neutralizing anti-VEGF Ab (n = 6 corneas for each group). Since VEGF has been shown to be an important angiogenic factor and has been implicated in acute lung injury, we assessed the contribution of VEGF to BALF-derived angiogenic activity. We assessed the in vivo angiogenic activity of random pooled samples of either control (n = 4) or ARDS BALF (n = 5) in the presence or absence of control or neutralizing VEGF Abs, using the rat cornea micropocket model of neovascularization (Fig. 7⇑ and Table II⇑). We confirmed the neutralizing capacity of these Abs using the corneal micropocket model. These Abs did not contain significant quantities of LPS contamination as assessed by Limulus assay, and all samples were normalized to total protein. Neutralizing Abs to VEGF did not significantly attenuate the angiogenic activity of ARDS BALF (4 of 6 corneas positive) as compared with control Abs (6 of 6 positive). The proliferative and chronic fibrotic phases of ARDS are associated with the formation of intra-alveolar granulation tissue. Although the development of granulation tissue is essential and necessary for repair of cutaneous injury (25, 26, 27), accumulation of intra-alveolar granulation tissue results in profound and deleterious effects on both the structure and function of the lung, leading to impaired gas transfer (19, 20, 28). 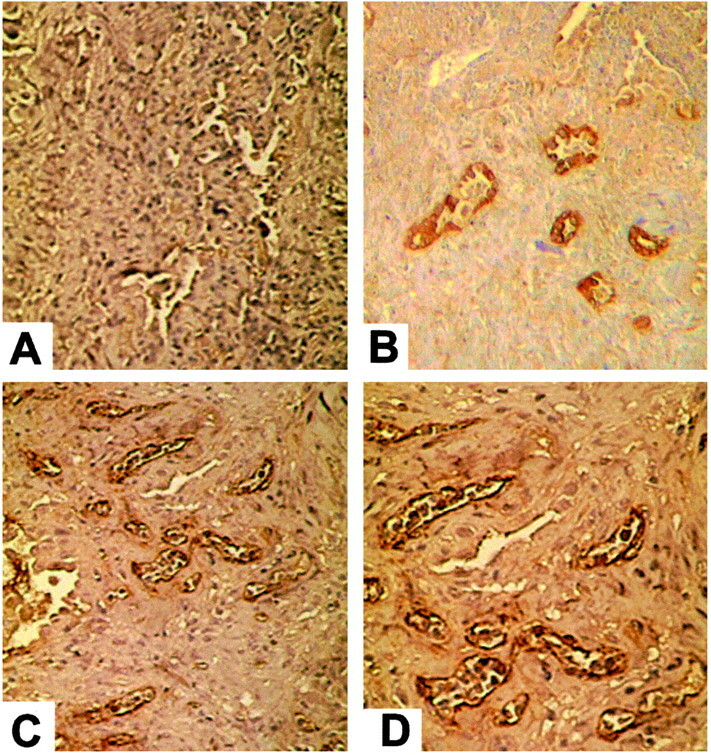 Granulation tissue resembles undifferentiated mesenchyme with the presence of fibrin, a predominance of type III, as compared with type I collagen, and a highly mobile and proliferative phenotype of endothelial cells leading to a vascularized capillary bed (i.e., angiogenic phenotype) (19, 20, 28, 29). As granulation tissue matures it provides the foundation for the initiation of re-epithelialization. However, type II pneumocyte proliferation on this expanding tissue often results in the loss of integrity of the alveolar airspace (5, 6, 30, 31). As the fibrotic stage evolves, the persistence of intra-alveolar and interstitial chronic inflammation is essential to the propagation of fibrosis. Angiogenesis is a salient feature of this fibroproliferative response and neovascularization provides essential nutrient support for mesenchymal cell proliferation (6, 25, 26, 32, 33). Thus, a potential mechanism for promotion of fibrogenesis in ARDS is dysregulation of the expression of angiogenic, as compared with angiostatic factors. 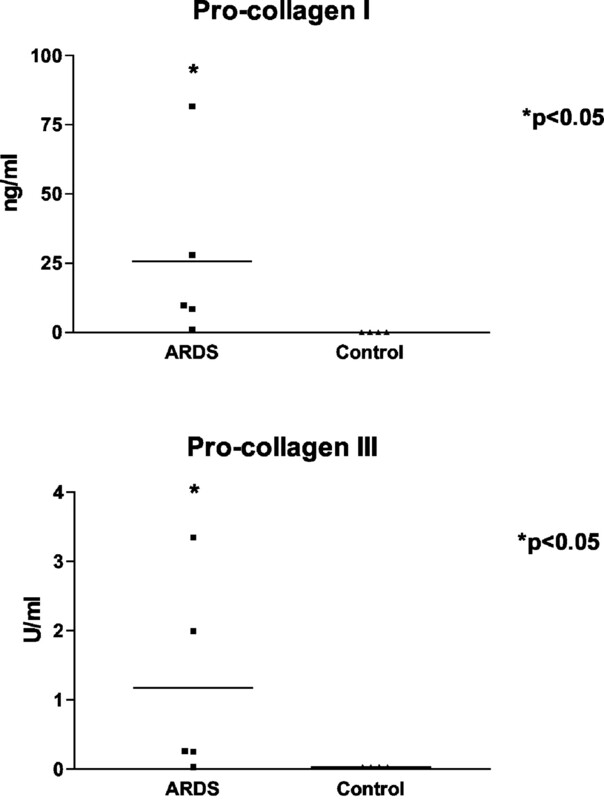 We found elevated levels of both procollagen III and I in patients with ARDS. This is consistent with previous work, which has demonstrated elevated levels of procollagen III in both ARDS pulmonary edema fluid and BALF as early as 24 h after injury (20, 34). Elevated levels of procollagen III are associated with increased mortality independent of other variables (19, 20, 35). Furthermore, levels of procollagen I correlate with increased risk of dying and are detectable in BALF within 24 h (35). Levels of IL-8/CXCL8 and matrix metalloproteinase-9 correlate with pro-collagen III in pulmonary edema fluid from patients with ARDS (28). These findings suggest that the fibrotic process starts early and is a poor prognostic indicator in ARDS. Furthermore, we have demonstrated evidence of vascular remodeling in ARDS as evidenced by immunolocalization of factor VIII-related Ag, a marker of endothelial cells. This is consistent with our previous findings of neovascularization in IPF and the presence of neovascularization in other chronic inflammatory processes such as psoriasis and rheumatoid arthritis (21, 36, 37, 38, 39). Our findings of elevated levels of CXC chemokines in BALF are consistent with previous reports of elevated levels of IL-8/CXCL8 in BALF that correlated with progression to ARDS (40, 41). Although undoubtedly neutrophils have an important role in ARDS, acute lung injury can occur in neutropenic patients. There is increasing evidence for alternative biological roles for IL-8/CXCL8 and other ELR+ CXC chemokines in disease processes, specifically in the regulation of angiogenesis (21, 38, 42). Previous workers have demonstrated the presence of angiogenic activity in ARDS (32). Henke et al. (32) demonstrated that BALF from patients with acute lung injury induced endothelial cell migration in vitro and angiogenic activity in vivo (32). They found that that basic fibroblast growth factor accounted for 30% of the angiogenic activity of ARDS BALF. We have shown that the CXC chemokines, IL-8/CXCL8, ENA-78/CXCL5, and IP-10/CXCL10 are important factors that regulate angiogenic activity in IPF (21, 36). We have further extended these studies to the murine model of bleomycin-induced pulmonary fibrosis and have shown that fibrosis can be attenuated either by the inhibition of the angiogenic chemokine macrophage-inflammatory protein 2/CXCL2 or augmentation of the angiostatic chemokine IP-10/CXCL10 (22, 43). These findings are further support for the important role of angiogenesis in the pathogenesis of pulmonary fibrosis related to DAD. In the present study, we have shown that ELR+ CXC chemokines are a significant source of angiogenic activity in ARDS. Neutralizing Abs to CXCR2 essentially inhibited all of the angiogenic response from ARDS BALF specimens. Furthermore, we found that CXCR2 was significantly expressed on vascular endothelial cells. We also found elevated levels of VEGF in BALF. However, the levels of VEGF were lower than those for the CXC chemokines and we have previously shown that they are equipotent on a nanogram per milliliter basis (44). Furthermore, VEGF did not appear to be a significant contributor to angiogenesis as assessed using the corneal micropocket model. Previous workers have demonstrated elevated levels of VEGF in plasma of patients with ARDS although another group have reported decreased levels in BALF within 7 days of ARDS onset (45, 46). 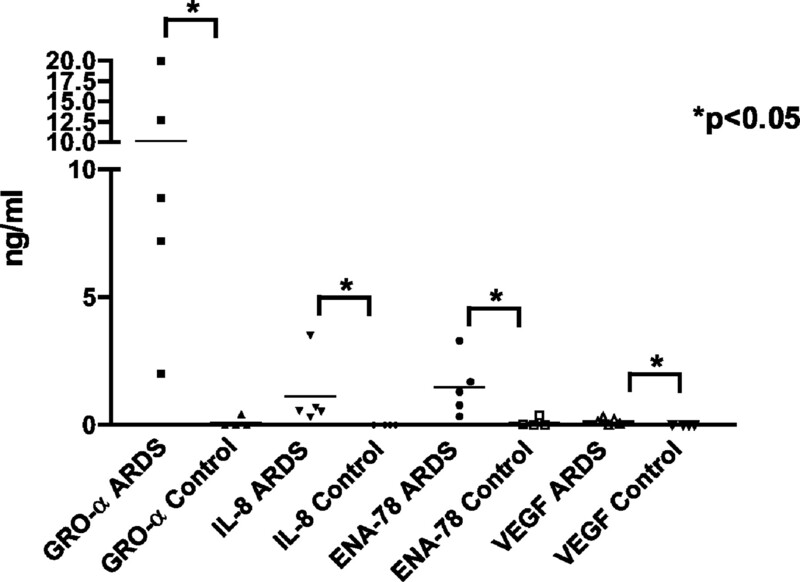 It has been postulated that VEGF contributes to the vascular permeability of ARDS. We cannot exclude a role for VEGF in vascular remodeling in vivo; however, our results would suggest that it plays a minor role. These findings support the presence of a dual regulatory mechanism for net angiogenic activity in ARDS patients, suggesting that ELR+ CXC chemokines are major angiogenic factors in ARDS. In contrast, IP-10/CXCL10, and potentially MIG/CXCL9, are important endogenous angiostatic ELR− CXC chemokines that similar to IPF are expressed at insufficient levels to down-regulate angiogenesis in ARDS. The predominant cellular sources of the CXC chemokines were mononuclear cells and in the case of GRO-α/CXCL1 mononuclear cells and epithelial cells. Although there was some overlap in the cellular sources of the angiogenic chemokines, the fact that GRO-α/CXCL1 is also expressed in epithelial cells indicates a lack of redundancy in chemokine expression. This is similar to what we have described in IPF specimens where IL-8/CXCL8 is expressed predominantly by fibroblasts and ENA-78/CXCL5 is expressed predominantly by epithelial cells, suggesting that the expression of chemokines with similar biological functions does not necessarily indicate redundancy of cellular source (21, 36). Furthermore, it indicates a role for nonimmune cells in the pathogenesis of the fibroproliferation associated with ARDS. In summary, we have demonstrated that there is increased angiogenic activity in BALF from patients with ARDS that is significantly attributable to CXC chemokines and correlates with the presence of procollagen III and I. This supports the notion that angiogenesis supports fibroproliferation and that ELR+ CXC chemokines have a significant role in the progression of the fibroproliferative phase of ARDS. Furthermore, the receptor responsible for the angiogenic activities of the CXC chemokines is CXCR2, and there is evidence that CXCR2 is down-regulated on neutrophils during sepsis. Therefore, targeting this receptor could potentially inhibit angiogenesis without any detrimental effect on neutrophil function (47). Although one would be reluctant to inhibit potent neutrophil chemoattractants in the setting of infection, selective inhibition of angiogenic chemokines in the lung may have a beneficial role in the prevention of the ongoing fibroproliferative phase of ARDS and deserves further investigation. ↵1 This work was supported, in part, by National Institutes of Health Grants P01HL67665, HL03906 (to M.P.K. ), HL04493 (to J.A.B. ), P01HL67665 (to M.C.F. ), P01HL67665, HL66027, and CA87879 (to R.M.S.). S.C.D. was funded by the Wellcome Trust. M.P.K. is the recipient of a Dalsemer Scholar Award from the American Lung Association. J.A.B. is the recipient of a Research Award from the American Lung Association and the American Lung Association of California. ↵3 Abbreviations used in this paper: DAD, diffuse alveolar damage; ARDS, acute respiratory distress syndrome; VEGF, vascular endothelial growth factor; BALF, bronchoalveolar lavage fluid; ENA-78, epithelial neutrophil-activating protein 78; GRO, growth-related oncogene; IP-10, IFN-γ-inducible protein 10; MIG, monokine induced by IFN-γ; CXCL, CXC ligand; PIIIP, procollagen III peptide; IPF, idiopathic pulmonary fibrosis. Corrin, B.. 1996. Diffuse alveolar damage. T. W. Evans, and C. Haslett, eds. ARDS: Acute Respiratory Distress Syndrome 37 Chapman & Hall, London. Wright, J. L.. 1995. Adult respiratory distress syndrome. W. M. Thurlbeck, and A. M. Churg, eds. Pathology of the Lung 2nd Ed.385 Thieme, New York. Hasleton, P. S.. 1996. Adult respiratory distress syndrome. P. S. Hasleton, ed. Spencer’s Pathology of the Lung 5th Ed.375 McGraw-Hill, New York. Davidson, J. M.. 1992. Wound repair. J. I. Gallin, and I. M. Goldstein, and R. Snyderman, eds. Inflammation: Basic Principles and Clinical Correlates Raven, New York. Bitterman, P. B. 1992. Pathogenesis of fibrosis in acute lung injury. Am. J. Med. 92:39.S..
McDonald, J. A. 1991. Idiopathic pulmonary fibrosis: a paradigm for lung injury and repair. Chest 99:87.S..
Sime, P. J., J. Gauldie. 1996. Mechanisms of scarring. T. W. Evans, and C. Haslett, eds. ARDS—Acute Respiratory Distress in Adults 215 Chapman & Hall, London. Koch, A. E., P. J. Polverini, and S. J. Leibovich. 1986. Stimulation of neovascularization by human rheumatoid synovial tissue macrophages. Arthritis Rheum. 29.